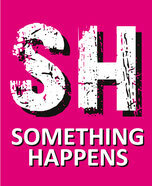 Something Happens is a collective created in 2016 by artists, sociologists and curators. The aim is to promote new ways to exhibit in public space and to explore new territories of art. This collective is nomad and multidisciplinary.